The Legendary Lip watch has returned! Generations ahead of their time..... Fred Lip's company teamed up with the famous French designer, Roger Tallon in the 1970s to create the world famous Diode watch design. Now for the first time since 1975, the revolutionary LIP DIODE LED Watch has been reissued by the reformed LIP company. 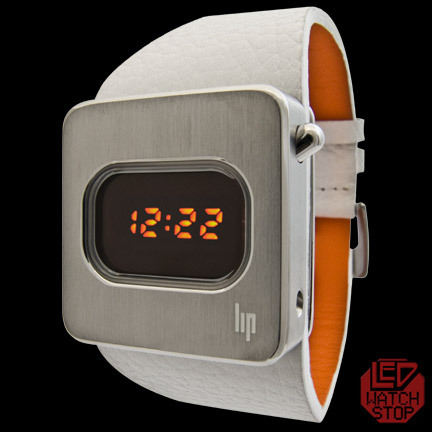 This rare model features an attractive orange LED display, brushed stainless steel case and integrated white leather strap. This is a hard to find limited edtion with only a handful left. Get yours before they are gone!